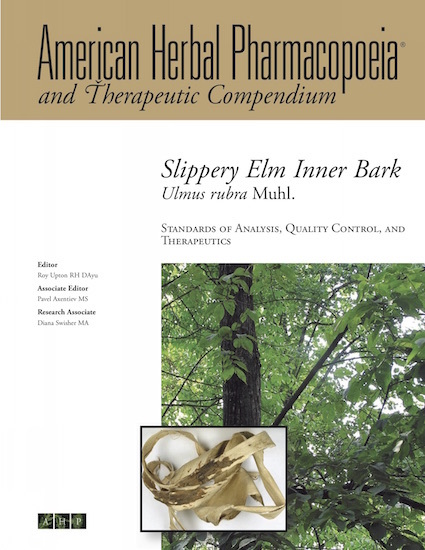 The inner bark of slippery elm (Ulmus rubra) has a variety of uses, from being an integral component of several popular herbal tea blends (e.g., Essiac®, Throat Coat®), to being the essential primary ingredient in throat lozenges. Historically, it was praised for its demulcent properties, which were utilized in the treatment of a variety of inflammatory conditions of the digestive, respiratory, and urinary systems, and topically for skin diseases and healing wounds. Though modern medical research on the inner bark is scarce, historical information is abundant and presented in great detail in the Medical Indications Supported by Traditional Use section of the AHP monograph. On the quality side, there are a variety of grades that are graded according to the amount of inert outer bark present in bark materials. The outer bark is devoid of the desired mucilage, the levels of which are determined by using the Swelling Volume Assay described in the Analytical section of the monograph. This method allows for quantitative assessment of the bark mucilage in contrast to some methods that only qualitatively assess mucilage. The AHP assay builds on that of the European Pharmacopoeia (2.8.4), which is applied to botanicals such as psyllium husks, but has been considerably improved to greatly reduce procedure time. The assay is simple, straightforward, and provides a convenient way for quality control of the material, poor examples of which can often be found on the market.